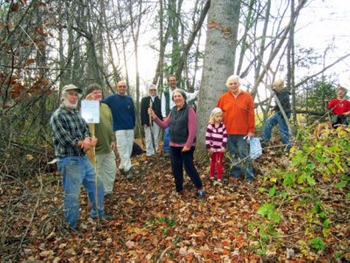 The first and third Sundays of each month, mid-March through October, weather permitting, join SCLT members to explore local favorite walks in the Saluda area. Walks generally last about an hour and a half, and besides showcasing our local treasures, encourage getting folks outside. Walkers meet at the parking lot of the Saluda Library at 2pm. 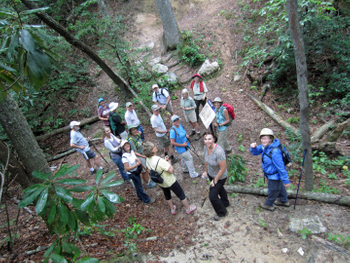 A SCLT member will keep you aware of the terrain of the trail and share their insights about the history, flora, and fauna of the area as they lead each walk. Prepare for each walk with comfortable shoes (and, where you see an * wear water shoes), a walking stick, water, and a snack. Feel free to bring your field guides and a camera. Please provide any pertinent medical history to you guide. Many of these hikes will access private property. SCLT has obtained the owners' permission to allow you to access these areas that are normally not available to the public. Call ahead to determine whether the hike will welcome four-footed companions. 1 mile easy to moderate. This is not a long walk but more of a meander of 1-2 hours. We will walk among a huge population of spring wildflowers located at Twin Bridges over the Pacolet River on US-176 south of Saluda. This is a strenuous walk from Nancy Barnett’s home down to the Pacolet River to see abundant wildflowers. 1-2 miles steep descent, recommend hiking sticks. A moderate out and back walk on a well maintained trail along Joel’s Creek, passing 4 waterfalls along the way. There is a side spur which goes down to Turtle Falls and is fairly steep which will be optional." 1 mile easy woods trail walk of 1 hour. It traverses a stream and connects Eseola Drive through the woods to Laurel Drive. This is a great in-town option to road-walking. Please leave Fido at home. This is an old road that went from Saluda to Green River back in the 1920’s, before the current Green River Rd was built. It follows a stream flowing down to Fish Top and is now protected with a conservation easement. The walking will be easy to moderate, and occasionally steep, but the views are worth it. Enjoy a moderate walk on private trails around three continuous cabins ending with lemonade on the veranda. A moderate walk on private property is 9 acres of forest, creeks, a pond and well-marked trails. There is an old stone home site and the property is full of native plants. 2 mile moderate out and back of 2 hours along Cove Creek to the falls with a nice pool at the bottom. Dogs and kids love this spot! 1 mile loop of moderate walking 1-2 hours. Water shoes recommended. The trailhead is located on Pearson Falls Road just above the new concrete bridge over the North Pacolet River. The trail is well blazed, kid and pet friendly, and has several easy water crossings. This moderate hike will start at the top of Brushy Ridge on the Poinsett Passage of the Palmetto Trail and will proceed along the top of the ridge to Hogback Mountain Rd. There someone with a car will meet the walkers to drive them back to Saluda. 2 mile 2 hour moderate walk on Burdett’s property offering beautiful fall foliage as well as lush vegetation and dancing waters along Camp Creek. Easy to beyond moderate. Explore the site of the Battle of Round Mountain. Located off Howard Gap Road this walk offers a picnic area, rock outcroppings, and for the adventurous, a strenuous climb to the top of the mountain for Piedmont views.